In April of 2011 as I perused the list of participants in the Portland Indie Wine and Food Festival, my eyes stopped at the word Malbec. Isn't Portland the City of Roses and Pinot Noir? I wondered who was making Malbec in Oregon and why, secretly admiring the rebel element. As a Seattle native, I have always had a special place in my heart for Washington reds. 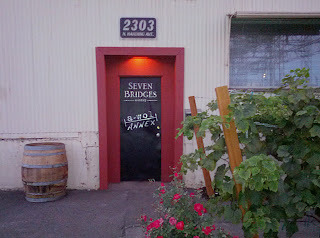 A follow up e-mail led me to Bob Switzer and the burgeoning, indie-no-more world of Portland's Seven Bridges Winery. One afternoon, Bob met me at the winery, located in an industrial area near the Fremont Bridge. Back then, the winery was downstairs, so we entered the side of the building and walked down a ramp to their basement space. Inside the cement room were barrels and some wine equipment, with just enough space for a few people to maneuver around it all. 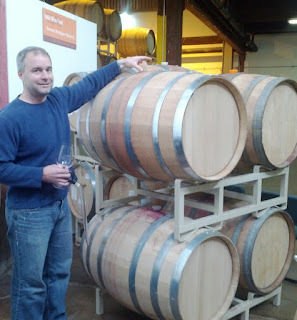 Bob explained that he and co-winemaker Kevin Ross, make the type of wine they both personally prefer, full bodied reds. The grapes, Cabernet, Malbec, Syrah, Petit Verdot, Sangiovese, Cabernet Franc and Merlot, are sourced entirely from Washington. Bob crawled over barrels, gathering various samples. Our conversation became more animated and enthusiastic as we talked about Les Collines, Elerding, other top tier Washington vineyards and our affinity for these red wines. I could hardly believe my luck as I tasted these amazing wines being made right here in NE Portland. I left with a somewhat smug sense of satisfaction, feeling that I had unearthed a jewel, a secret oasis of beautiful big reds, hiding right here amongst a sea of Pinot Noirs. Later that summer, my husband and I headed to Walla Walla for a long weekend. Before we went, Bob put us in touch with Mike and Cindy Rasch of Golden Ridge Vineyard. During our time there, we toured Golden Ridge, a primary source of Seven Bridges' Merlot. The vineyard was planted in 1998 with the technical assistance of Paul Champoux of Champoux Vineyard. We were fortunate to be there just as the grapes began to go through veraison. We sent photos back to Bob and shared our impressions about what we saw. Mike's meticulous care of the vines was seen row by row. He pointed out the variation among the different areas within the vineyard, and how those differences required row specific care; the vineyard was pristine and perfectly cared for, which was clearly not the case in other vineyards we saw nearby. The 2009 Merlot is 95% Golden Ridge fruit, the balance coming from Union Gap Vineyard in Yakima. Seven Bridges bottles both single varietals and blends. They do not follow a set program for bottling; a blend may be made one year and not the next. As the wines develop in barrel and begin showing the range of their potential, decisions are made as to whether to bottle something as a single varietal or as a blend, based on how each barrel in that particular vintage expresses itself. One hallmark of all of the wines is a purity of fruit. Glass filling bouquets, rich, complex flavors and a clear expression of fruit is found even with the variables of vintage variation. Last summer, Bob shared a sample of the unreleased 2009 Elerding Cabernet with me. I knew he had something special with this wine after the first sip. It made a lasting impression, even at that stage. I thought about that wine several times over the summer, anticipating its fall 2012 release. Of all the wines Bob and Kevin have made, this is Bob's favorite. Others who have tasted far and wide within the world of wine, recently had a thing or two to say as well. Bob has a friend who has participated in a tasting group that was originally established in 1973. Last month, this friend hosted the group's monthly event, which featured a blind tasting of wines from Seven Bridges and Long Shadows Vintners. None of the members knew which types of wines were to be poured or where they were from. Long Shadows, a premier Northwest winery with a proven history of excellence, is a common name in the Washington wine scene and beyond. Long Shadows is Allen Shoup's joint venture featuring "highly acclaimed winemakers from different regions of the world...bring(ing) their expertise to Washington to create some of the most special wines ever crafted from the region's top vineyards; wines that would stand shoulder to shoulder with the world's best." Long Shadows 2006 "Chester Kidder"
Seven Bridges Winery 2009 "Resolution"
The results were tallied. (Bob's friend did not vote.) The $30 bottle of Seven Bridges "Resolution" received 1st place votes from six of the eight members and 2nd place votes from the other two. Overall, it took 1st place in the flight, with the highest average score of 93. 2nd place overall went to the $50 Long Shadows "Pirouette" with an average score of 91. For comparison, in published reviews the "Pirouette" received a 93+ from Wine Advocate and a 93 from Steven Tanzer. Seven Bridges Winery 2009 "Prima Nata"
The Seven Bridges $40 Elerding Cabernet received four 1st place and two 2nd place votes, scoring the highest overall with an average of 94. Their $36 "Prima Nata" averaged 93, tying for second place alongside the $60 Long Shadows "Feather". Again, for reference, both Wine Advocate and Wine Enthusiast gave "Feather" this same score of 93. 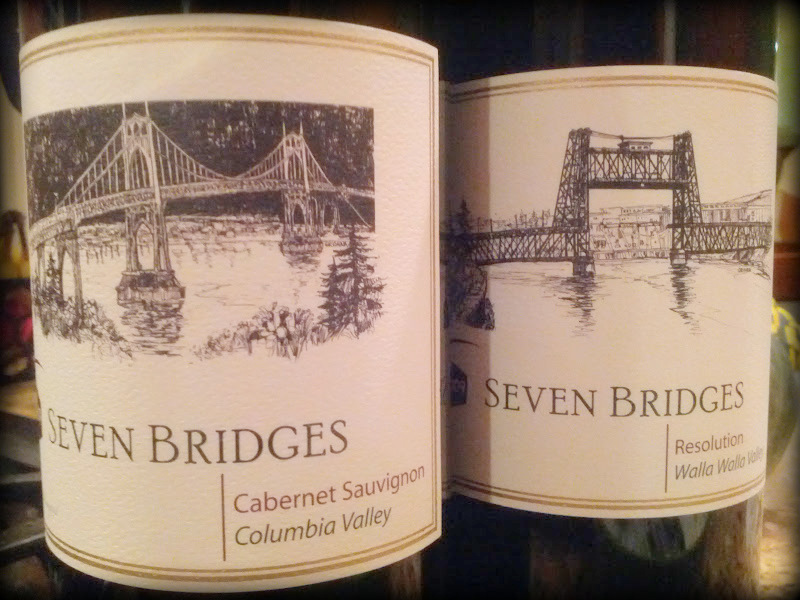 The tasting group was not only surprised by the results, but also by the fact they had never heard of Seven Bridges. That evening, some group members made plans to buy cases of the wines. When the day arrived to pick up at the winery, they had the opportunity to revisit the wines and were equally impressed the second time around. I also revisited the Elerding Cabernet after its recent release and wrote the following description on Day 1, although it continued to evolve fantastically through Day 3 until the last drop was gone. "burst of savory combined with juicy raspberry/blackberry pie, baked with a hint of cinnamon and other baking spices. It has an earthy element, and a touch of juice from a perfect, summer garden tomato. Savory, clarity, pure, refined and elegant, not overbearing." With only 72 cases made, this $40 stunner won't be around for long. The 2009 "Prima Nata" had a case production of only 61. The 2010 rosé sold out the day it was released. Contact the winery soon if you want to get your hands on these wines and their other equally notable releases. Joining the wine club is a great way to make sure to have access to these wines in the future. In the fall of 2011, the winery expanded and is now upstairs encompassing a large part of the building's open and spacious main level. There is now a tasting bar and seating area where guests can watch the rest of the goings-on within the winery. Open Saturdays 1-5 and by appointment, Bob, Kevin or Jill will be there to greet you, answer questions and show you around the place when possible. A mid-winter event is in the works, and perhaps another "Passport" event with the other PDX Urban Wineries will take place in the future.